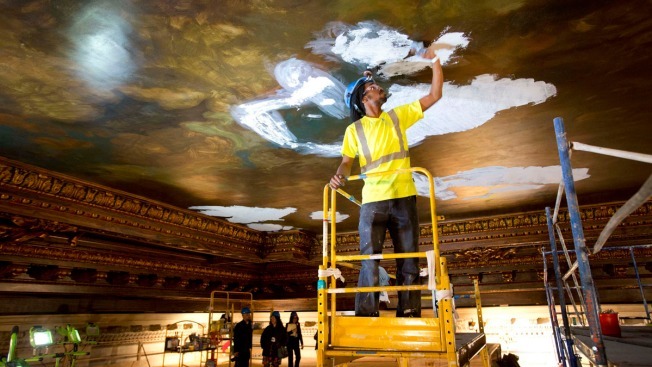 Fernando Cameron, a conservation technician with EverGreene Architectural Arts, smooths plaster into the ceiling of the New York Public Library's catalog room in preparation for the installation of a new mural. It wasn't your run-of-the-mill package delivery. It arrived in two sections — canvases tightly rolled up like rugs — and hoisted up 50 feet to a massive scaffold "dance floor" that ran the length of the ceiling where conservators and other artists were still busy working. On Thursday, the canvases were rolled out, measured and over many hours installed over the existing mural that experts had determined was beyond repair. Both historic rooms have been closed since May 2014 when a 16-inch plaster rosette dropped from the reading rooms' ornate ceiling. That precipitated an inspection of the catalog room where the mural was found to have suffered irreparable discoloration, overpainting and water damage during its 105-year history. "It is important, as great stewards of this beloved landmark, to ensure those ceilings are as inspiring now as they were when the building opened in 1911," said NYPL President Tony Marx. "We've touched every inch of the ceiling," said Neela Wickremesinghe. "We vacuumed and hand-cleaned the entire ceiling ... and in the process anything that has been loose has been secured." Wickremesinghe and her team of decorative painters, conservation technicians and other artists began working on site on Feb. 1, everything from securing plaster elements to "in-painting," matching colors of missing paint in the decorative cast plaster perimeter. "In conservation work you want to make sure that you can always go backward," said Wickremesinghe. Work on the mural replication began at the EverGreene's Manhattan studios in January. Its artist, Zinni Veshi, called it "the most exciting job I have done in 14 years," describing the mural's clouds "like a symphony" that's in harmony with the building. "What we tried to do is create this timeless sky. ... to get lost in and to contemplate under," said mural director Bill Mensching. Because the mural was so far gone, they relied on examples of Finn's other works found around New York City, including at the Morgan Library & Museum and also the black and white photos the company used to recreate the similar mural in the Rose reading room. "We stayed true to him," said Mensching. "We could only stand back 20 feet in the studio. The challenge was to see the work from the viewer's distance," he said.